Sabrina graduated from Madison High School in Middletown, Ohio in 1974. She attended Miami University for 2 years. 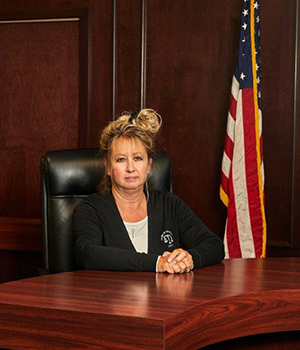 She has served in the legal system for over 22 years which includes 5 years of employment with the law firm of Ruppert, Bronson, Chicarelli, & Smith. She became employed with the Franklin Municipal Court in April 2001 as a Deputy Clerk. She is a member of the Southwestern Clerks Association & Ohio Association of Municipal Clerks. Sabrina received her appointment as Clerk of Courts on August 28, 2017. Her duties are mostly administrative, including supervising deputy clerk staff, budgets and purchasing requirements for the court. She is responsible for distribution of all monies received by the court and implementing procedures required by any changes in laws affecting municipal courts. She and her staff's most important goal in their workplace is to offer a friendly and helpful atmosphere to anyone they may come in contact with during their work day. As anyone who works in the legal system knows, our jobs can be both challenging and rewarding. She considers her staff to be one of the best in the legal community.